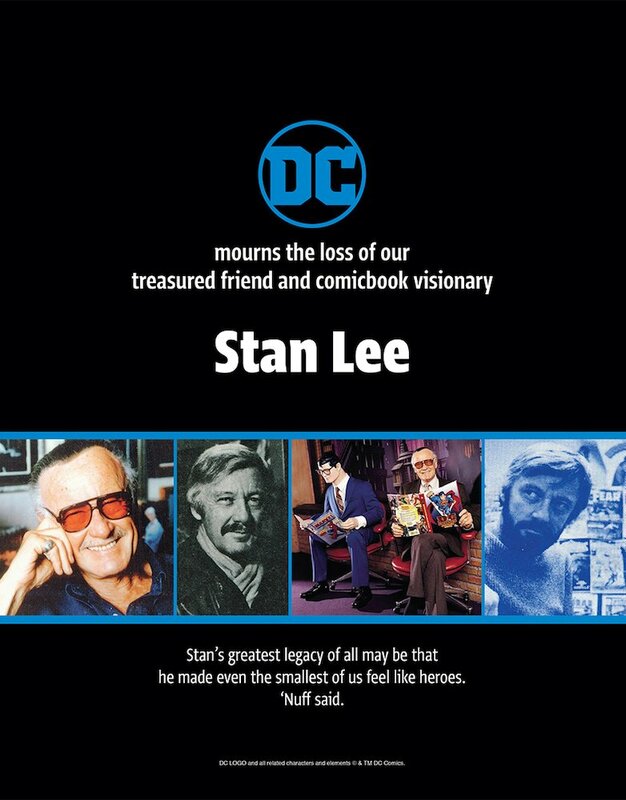 Though Stan Lee wrote a series of stories on the likes of Batman, Superman, and Wonder Woman in the early 2000s, the greater mark that the late comic book creator left on DC was undoubtedly through the influence of his work with Marvel. Either way, it’s easy to see why the company would feel a debt of gratitude to the man who helped make the superhero genre what it is today, and in the latest issue of The Hollywood Reporter, DC showed their appreciation for Lee and his legacy with their own full-page poster. Stan’s greatest legacy of all may be that he made even the smallest of us feel like heroes. This poster is just one of several published in the new THR, with Disney, Fox, and Sony also offering their thanks for the characters he created, along with a message from Marvel Productions’ President Margaret Loesch and a tribute signed off by the original six stars of 2012’s The Avengers. Though the Marvel-DC rivalry will surely rage on between the fans, Stan Lee remains a figure who earns respect from both sides of the divide, and as the DCEU works to recreate the success of Marvel’s cinematic universe model, it’s clear that the man’s legacy will continue to evolve and expand beyond his own brand.